Pixels that are not working have been detected and captured by an optical microscope. With Plessey's in-house FIB, lacking an electron beam not only for high-resolution imaging but more importantly for target area location makes the task very challenging since excessive damage from the ion beam could be induced while locating the pixels in question. In this case, FIB-SEM provides the perfect solution. 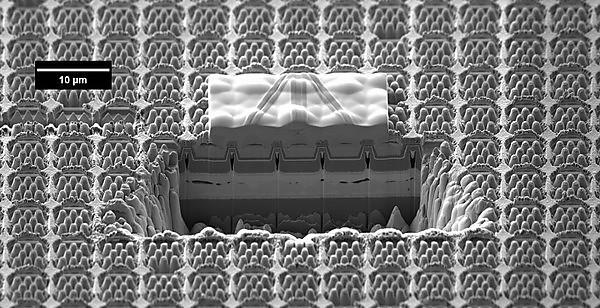 Using SEM to precisely locate the dead pixels within LED chips. Cross-sectioning several pixel units, imaging the slice sections. 3D run, if necessary, on a dead pixel with a comparison with its neighbouring good one. Discrete cross-sections were made within a dead pixel with a step size of approximately 250 nm. Abnormalities were found in the layers, as can be seen in these slice images. A full 3D run is even more helpful since it provides the power of reconstructing the entire dead pixel, in order to have an overview of the scale and precise positioning of the abnormalities present (red circled in the image below). The possibility of viewing those imperfections freely in 3D is of extra value for the engineers to work backward and search for their reason and nature.